Community Photo of the Month! 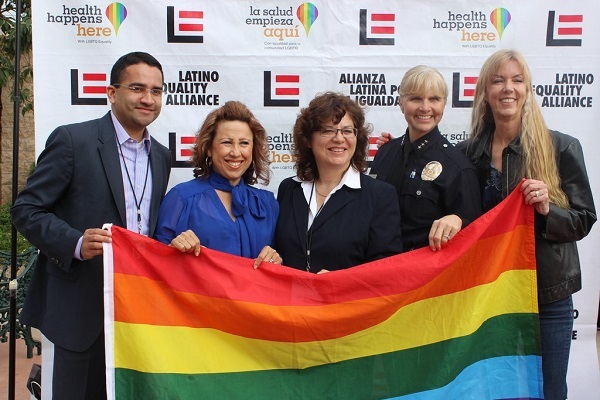 Boyle Heights forum opens dialogue on issues surrounding LGBTQ youth! Chicano Latino Youth Leadership Project, Inc. Through a generous grant from the Comcast Foundation and in partnership with the California Latino Legislative Caucus, the California State University, Sacramento-Center for California Studies, the University of California Center at Sacramento, the University of Southern California and the Association of Independent California Colleges and Universities, the CLYLP is sponsoring a four-week fellowship program for six (6) CLYLP summer conference alumni who have completed at least their first-year of college/university studies. The Comcast Fellowship program will take place Wednesday, June 26 - July 27, 2013. Volunteerism in a leadership capacity during non-work hours through placement with one of the CLYLP summer conference planning committees. Stipend. Fellows will each receive a stipend of $3,000 for the four-week period; these funds will be provided in four (4) installments as part of successful completion of components of the program. Work Placement. Each fellow will be placed in a legislative office in Sacramento for four (4) weeks and will be assigned a several mentors to support their work and will be assigned a mentor to support their work. Housing & Transportation Arrangements. The fellows will be provided housing and will have access to public transportation in order to complete their assigned internship at the State Capitol, volunteer at the CLYLP office, and attend academic course sessions in downtown Sacramento. Interactions with State Leaders. Through CLYLP partners, fellows will have the opportunity to engage key leaders in various sectors of California’s life and culture. Site visits and informal gatherings will be provided through the month-long program designed to build community and expand the fellows’ leadership and support network. Leadership Development & Training. The fellows will receive exposure to a leadership curriculum that includes a focus on the inner workings of California government, the factors influencing policy makers and current and future policy issues facing California taught by academic faculty and leaders within the state. In addition, the fellows will serve in key leadership roles in the final planning and execution of the CLYLP Summer Leadership Conference. 1. Completed the CLYLP Summer Leadership Conference Program, the CLYLP San Joaquin Valley Institute or the CLYLP Los Angeles Institute. 2. Demonstrated leadership in their community since participating in the CLYLP Summer Leadership Conference, the CLYLP Los Angeles Institute or the CLYLP San Joaquin Valley Institute. 3. Completed at least their first year in college and be returning to their studies as a full-time undergraduate at an accredited college or university. 4. Committed to being in Sacramento during the month-long fellowship period and fulfill all the requirements of the program. Weekend travel is strongly discouraged and will only be considered prior to the start of the program on a case-by-case basis. Hollenbeck Middle School in partnership with Alliance for a Better Community, LA Conservation Corp, and other community partners and Building Healthy Communities (Boyle Heights) are celebrating their collaboration to develop a community garden honoring the school’s 100thCentennial. Through the BHC Small Grant the school received, it will support the development of a garden for the students and parents of the campus to learn and grow vegetables/fruits. 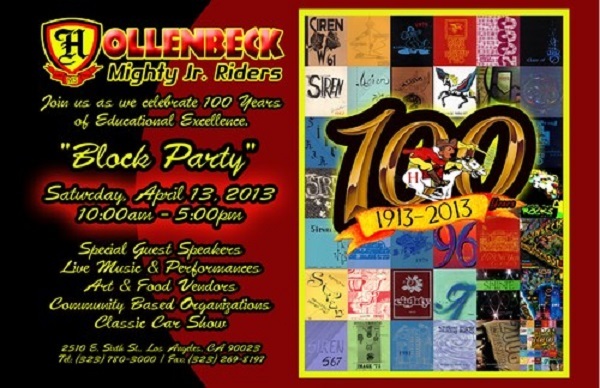 We are excited to invite you to join us in celebrating Hollenbeck Middle School’s 100th year anniversary! Hollenbeck Middle School has been an essential part of Los Angeles Unified School District in the community, rich with history and cultural diversity. On Saturday, April 13, 2013. From 10:00 am - 5:00 pm, we plan to have a full block party to celebrate its centennial, while also serving to promote organizations and businesses in the community, we anticipate more than 3500 people attending this event. 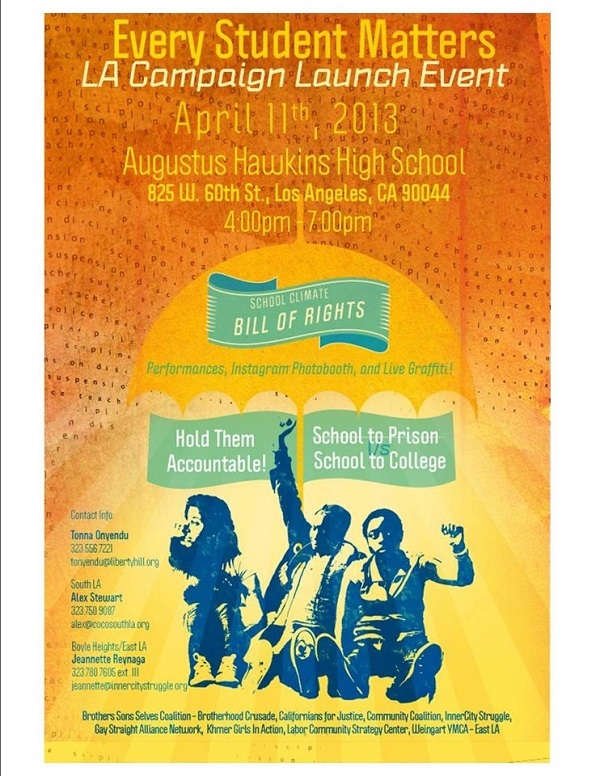 We plan to invite current students, their families, past alumni, and Boyle Heights residents to attend this celebration. Hollenbeck Middle School, the home of the "Mighty Junior Riders" is located in Boyle Heights, CA. It currently serves grades 6th to 8th grade (1400 students). HMS has been serving the community since 1913. It was first named Boyle Heights Intermediate from 1913-1923; then named Hollenbeck Jr High School from 1923-1993; and now named Hollenbeck Middle School from 1993 to present. Last week the Weingart East Los Angeles YMCA’s Youth Institute and Youth and Government Program helped support Long Beach’s Every Student Matters Campaign through the Brothers, Sons, Selves Coalition. The event was a huge collaborative success with an amazing youth turnout filled with activities, panels, music, and good vibes. In order to replicate this success, the Brothers, Sons, Selves Coalition (BSS) would like your participation in the Every Student Matters Los Angeles Campaign Launch regarding the diverse and burgeoning efforts to reform school discipline policies and practices. The BSS coalition is made up of eight organizations from across LA County working to improve the life outcomes of boys and young men of color both locally and statewide. Our local effort is focused on reforming current school discipline policies and practices that disproportionately impact students of color. We have strong participation and leadership coming directly from high school young men of color from South Los Angeles, Boyle Heights and Long Beach; young men working collaboratively to drive a campaign that can build upon various efforts to address the root causes of school discipline issues that are pushing them and their peers out of school. As part of this campaign, we are hosting a public launch event and would love for you to attend to assist us in moving our work forward. their email in the fields and the petition will be sent to them automatically. Copyright © 2012 Building Healthy Communities, Boyle Heights, All rights reserved. Sent to joelperezsf@gmail.com — why did I get this? JOIN THE BHC-BH YOUTH MOVEMENT! The Youth Engagement Committee would like to invite you all to ride with us during CICLAVIA on Sunday, April 15. We’re getting a large group of Boyle Heights youth together for the ride and activities afterwards. cicLAvia is an amazing community building event, and it would amaizing to have some of our adult allies join us and have some fun together! 3-5- Return to the Y for food (delicious quesadillas) and fun community building activities. Please let us know if you're "down to ride" by emailing David (davidvaldez@ymcala.org) and Eric (ehubbard@jovenesinc.org) so we can get a head-count for food. East LA Community Corporation in partnership with Pan American Bank and the Center for Asset Building Opportunities (CABO) is offering free tax preparation through the Greater Los Angeles Earned Income Tax Credit (EITC). The service is to help working families save money by providing free income tax preparation and access to tax credits for taxpayers who have earned $50,000 or less the previous year. Deadline is a FEW DAYS AWAY on Friday the 13th!!!! Applications are now being accepted for the first programming class of the Weingart East Los Angeles YMCA Youth Institute. Beginning this summer, Boyle Heights youth will learn a variety of digital media skills that will enhance their academic achievement. Youth Institute students will learn film editing, camera technique, directing, digital music, graphic design and career professionalism. The 2012 summer class will launch on June 25, 2012 with a wilderness retreat to Kings Canyon National Park and will conclude with a film festival celebration on August 18, 2012! A mobile infrastructure for economic development and food access Community Planning Workshop. The workshop is part of the American Planning Association's National Conference this weekend, and will be convening 30-50 urban planners from across the country in Boyle Heights. We will be tasking them with helping to put together an ordinance that legalizes street vending (from a planner's perspective). The agenda includes a neighborhood bus tour, lunch and even a mixer after. The yaes hora ¡Ciudadanía! (It’s time, Citizenship!) campaign began from the immigrant mobilization of 2006 to assist eligible Legal Permanent Residents become US citizens and have a voice in the American political process. There are 3.3 million Legal Permanent Residents in California and 2.3 million are eligible to apply for US citizenship. As we look to the presidential elections in 2012, it is critical that those eligible to become US citizens are able to have a political voice in the future of the country. 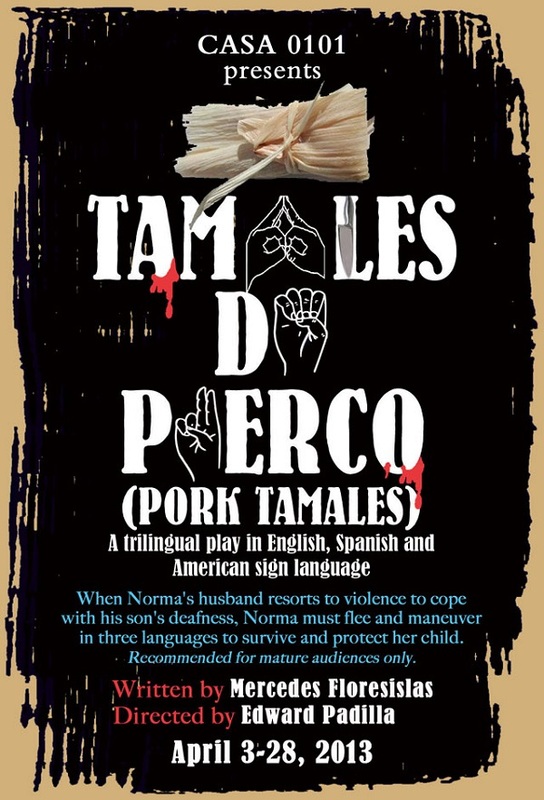 Please RSVP by emailing Alma Morales at almalavoice@gmail.com or via phone at (323)793-5470. A free basic training on major food security issues and hwo to speak about them. PROYECTO JARDIN IS LOOKING FOR THE BEST COMMUNITY SALSA IN EAST LOS ANGELES! LOS ANGELES, CA: Proyecto Jardin hosts monthly Community Garden Workdays every first Saturday of the month and May 5th will feature a salsa contest for the community as well as working and planting a healthy salsa garden. Workday begins at 10:00 and contest will follow at 1:00pm. Contest is open to East Los Angeles residents and immediate surrounding communities. Contestants must register in advance. 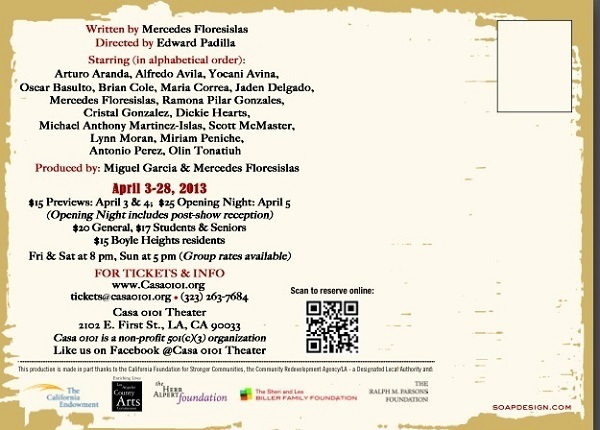 Entry forms are available at Proyecto Jardin at 1718 Bridge Street, LA 90033 behind the White Memorial Medical Center between State and Boyle, it can also be downloaded through Proyecto Jardin’s Facebook page, or requested via email. Did you know that in Los Angeles County, over 200,000 Latino/as are unable to read? Learn to read and write in Spanish from anywhere, using your phone. CELL-ED, a partner of Urban Strategies at the Pueblo del Sol Community Service Center, is looking for adults to participate in a study about teaching literacy over mobile phones. The program will help Spanish-speaking adults learn to read and write in Spanish and is completely free. Participants will earn $75 for completing 2 in-person interviews conducted at the Pueblo del Sol Community Service Center, located at 1300 Plaza del Sol, Los Angeles. To sign-up and for more information, contact Karla Perez, at (310) 550-3866 or the Pueblo del Sol Community Service Center at (323) 980-8100. Access resources and post comments on newly launched, “Opportunities and Challenges: Healthy Immigrant Integration in California” event page! The event page for “Opportunities and Challenges: Healthy Immigrant Integration in California” has launched! Visit the site here to access resources and post comments and feedback from the event held on March 20th at The California Endowment in Los Angeles. of out-of-school suspension rates there. forward. Please let me know if you are interested in learning more. This fall, the Attorney General’s National Task Force on Children Exposed to Violence (the “Defending Childhood Task Force”) will provide a final report and high-level recommendations to the Attorney General that will serve as a blueprint for addressing children’s exposure to violence. To accomplish this goal, we need your direct input now through written testimony. We need to hear both from individual community members and from organizations working with children and families who have experienced violence in order to understand what services and interventions are currently in place, to identify what is missing, and to determine what must change to better prevent and address children’s exposure to violence. Please submit written testimony―as an individual or on behalf of an organization―by the deadline of April 24, 2012. Written testimony may be formal or informal, and there are no requirements for length or format. The questions below are merely suggestions; your testimony is not required to respond to these questions nor is it limited to these topics. · What do you see as the greatest barriers to preventing and responding to the violence that children experience, as witnesses or as victims? · What additional information-gathering or research is needed to improve services and supports for children, families, and communities when they experience violence? · Are you aware of a strong and successful program that addresses the needs of children, families, or communities that experience violence? Please tell us about the program, including full name and contact information if you have it. What factors contribute to its success? Could it be expanded or replicated? · If you personally could make three recommendations to the Attorney General, what would you tell him should be done to prevent and respond to children’s victimization and witnessing of violence? Please be aware that written testimony is not confidential. It will be reviewed by task force members and staff, may be referenced in written or oral presentations of the task force, and will be publicly available upon request. It must be received by April 24 to be considered. For complete information about submitting written testimony, please visit: http://www.justice.gov/defendingchildhood/tf-testimony.html and for information about the Defending Childhood Task Force, please visit: http://www.justice.gov/defendingchildhood/. East LA Community Corporation has an exciting new position of an Administrative Assistant for BHC-Boyle Heights. BHC-Boyle Heights is a community collaborative of over 30 community based non-profit organizations, hundreds of community residents and public agencies. 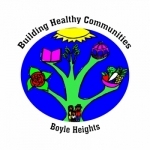 Building Healthy Communities (BHC) - Boyle Heights is seeking a strong individual to support the BHC-Boyle Heights Hub staff in an administrative assistant role. This person must be able to communicate effectively within the scope of work of Building Healthy Communities, as well as the residents in the community. The BHC-BH Administrative Assistant will effectively support the daily tasks of the Hub staff, and help coordinate meetings and events to ensure smooth and effective assemblies of Boyle Heights stakeholders. The Administrative Assistant will officially be employed and housed by East Los Angeles Community Corporation. BHC-BH Small Grants now AVAILABLE! ! ! 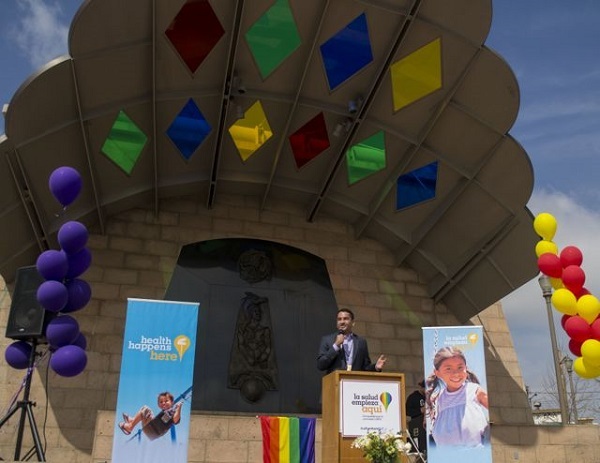 Through its Building Healthy Communities (BHC) strategic initiative, The California Endowment (TCE) is investing in 14 communities (including Boyle Heights) to build healthy and safe environments where people live, attend school, work and play. The BHC -Boyle Heights Small Grant Fund provides funding to support projects that improve youth and adult leadership, community engagement, and behaviors related to developing healthy and safe communities. Through this funding, local residents will have opportunities to acquire new skills and participate in a variety of health promoting events and activities. Applications are reviewed on a rolling basis. Completed applications are due by April 16th, May 14th, or June 18th, 2012 at 5:00pm. Award notification will be announced on April 25th, May 23rd and June 27th, 2012. • Grant amounts vary from $500 to $2,500, depending on scope of project. A complete budget and list of activities is required with completed application. • All supported activities must include BHC - Boyle Heights logo in promotional materials. • Organizations with non-profit 501(c) (3) status, or those with a fiscal sponsor may apply. Joel Perez, Communications and Project Coordinator, at joelp@elacc.org OR call (559) 430-6103. The 2012 Roadmaps to Health Community Grants, which will support two-year state and local efforts among policymakers, business, education, health care, public health and community organizations, will be managed by Community Catalyst and are part of the County Health Rankings & Roadmaps program, a collaboration of the Robert Wood Johnson Foundation (RWJF) and the University of Wisconsin Population Health Institute (UWPHI). Up to 20 coalitions will be awarded grants to create policy or system change to address the social and economic factors that impact the health of people in their community. The grantees will build on the County Health Rankings model, which highlights the critical role that factors such as education, jobs, income, community safety and having positive family and community networks in influencing how healthy people are and how long they live. The Roadmaps to Health grantees will focus on addressing those factors to create healthier places to live, learn, work and play.